Beauty comes in all shapes, shades, and sizes, as Schindler (Playing Hurt, 2011) demonstrates in her debut middle-school novel featuring an inventive girl and her bighearted grandpa. When the House Beautification Committee threatens the modest community with fines, Auggie and her grandpa get inspired to renovate their property at the corner of Sunshine and Lucky. Color-filled leftover cans of paint, bits of broken stained-glass from their storm-tossed church, and old car parts all play a part in the humorous transformation of their home and, ultimately, of the neighborhood. Auggie designs a growing crop of metal flowers and clever sculptures with moving parts—all welded by hardworking Gus. In creating these objects, Auggie hopes to accomplish great feats: to impress the committee, to win over the hard-hearted Victoria, and even to bring back Auggie’s mom, who left town long ago. While readers might well question such lofty goals, they will nonetheless cast their lot with Auggie and her grandpa, whose creativity, resourcefulness, and cheerful nature deserve respect. Few will object if the pair’s ultimate success seems a bit too fortunate. 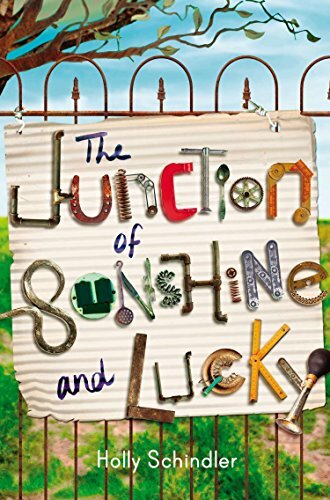 The Junction of Sunshine and Lucky offers a gentle, inspiring story of economically disadvantaged people uniting to assert their right to define beauty on their own terms.